Amputee Football was founded in the 1970s in America and today has established teams in over 32 countries. The sport was recently considered for inclusion in the Paralympic Games. The rules of the game follow those of standard football but with a few notable exceptions. Outfield players must have an amputation at or above the ankle and use crutches. Goalkeepers must be amputated at or above the wrist. The use of prostheses is prohibited. 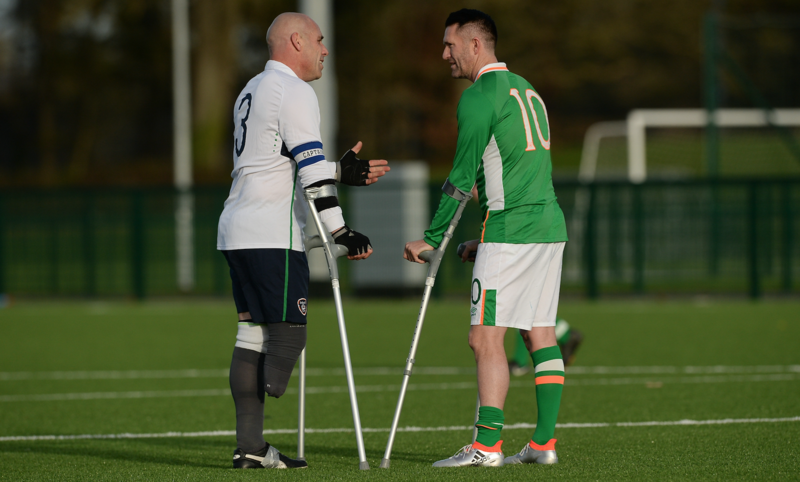 The Irish Amputee Football Association was founded in 2011 with the help and support of the FAI. The IAFA have sent teams to compete internationally in England and Poland and hosted their own six-nation tournament in August 2013. At the end of 2014 the IAFA will compete for the first time at the Amputee Football World Cup in Mexico. The dream is over yet Ireland can hold their heads up high as they depart the 2018 Amputee Football World Cup in Mexico having reached the Last-16 of the tournament. Ireland succumbed to a second defeat in the Amputee Football World Cup as they lost 3-0 to near neighbours England in Group A on Monday.